Britain has a real appreciation for pork, whether that be sticky braised pork belly or hangover-beating streaky bacon. But when pork goes into a hot oven, a particular sort of miracle occurs. Fat renders and melts into the meat. Edges get crispy. Fibres break down to become meltingly tender. Roasting a joint or pork or ham is a brilliant way of getting the most out of your meat, and we've pulled together a collection of roast pork recipes from our esteemed chefs and food writers to give you some porcine inspiration. 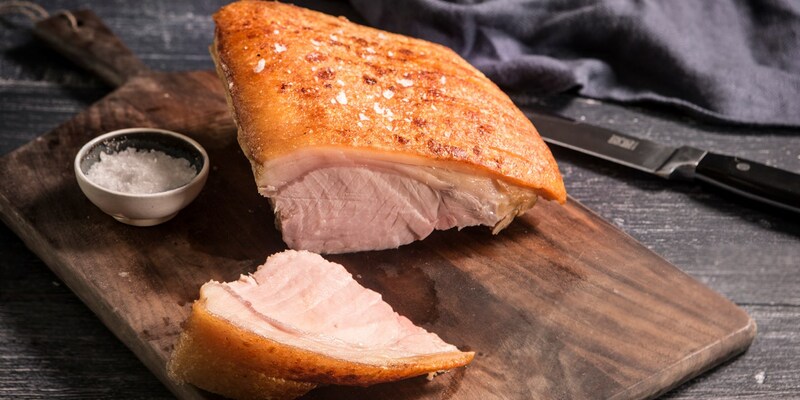 If you're looking for a knockout Sunday roast, Sally Abé's Roast pork loin with crackling is a great place to start, as Sally breaks down the keys to crispy crackling. If you've got a slab of pork belly ready, take a look at Tom Aikens' classic Roast pork belly with anise carrot puree and balsamic glazed carrots, or try Anna Hansen's Slow-roast pork belly with green pepper relish. Roasting is a fantastic option for ham too – take a look at Josh Eggleton's Honey mustard glazed ham recipe, as he explains how to prepare your ham from start to finish to get a perfect result.